Why not enjoy a stay in one of Ireland’s most remarkable castles on your next short break or vacation. Smarmore Castle combines the elegance and relaxed atmosphere of a bygone age with the comfort and range of facilities of the most modern accommodation. Like many other castles in Ireland, Smarmore Castle is steeped in history and legend. It is one of the oldest castles in Ireland and has been continuously lived in since 1320. It was once the ancestral home of the Taaffe family who owned many castles throughout Ireland and Europe. Today it is owned by the Mullen family who have opened its doors to guests who wish to sample the delights of staying in such stylish surroundings. Smarmore Castle is also one of the smallest castles in Ireland. It has only five bedrooms so you will never feel overcrowded when you stay. We take pride in getting to meet our guests and helping them to get the most from their stay. We can offer something to suit most tastes. You can be as energetic as you like in our leisure club or local golf clubs , take it easy curled up with a good book on the lawn or enjoy a delicious Italian meal in “La Cucina” restaurant. Smarmore Castle has the distinction of being one of the longest continuously inhabited Ireland castle. Records show that William Taaffe had his seat at the castle in 1320 after his family arrived in Ireland from Wales at the turn of the twelfth century. The Taaffes were one of the most famous families in this part of Ireland. 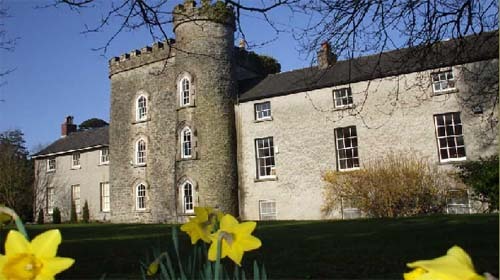 Successive generations of Taaffes continued to make Smarmore Castle their main residence in Ireland until the mid 1980s when the property was sold. with us enjoyable and memorable in modern accommodation in Louth. The building has been recently refurbished in a manner that preserves its unique architecture and character. Each of our five bedrooms contains a comfortable sitting area, writing desk, telephone, television, en-suite bathroom and large bed. 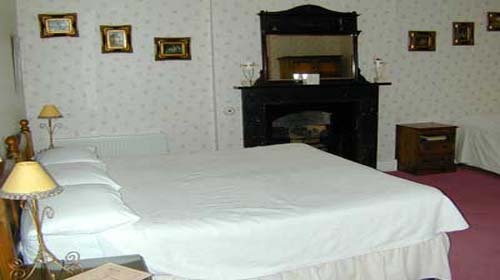 The Viscount’s room is located in the castle tower and has a large four poster bed. The Knight’s room is also in the castle tower and contains a large brass bed. The Taaffes room is one of our country house style rooms and overlooks the front lawn.The Count’s room is split into two parts and also overlooks the front lawn. The west facing Blue Room is the ideal places to watch the sun set in the evening as you enjoy a cup of tea or coffee. As Smarmore Castle is classified as an historic house by the Irish Tourist Board we do not have a bar on site. However “La Cucina” restaurant in the castle courtyard does have a wine licence. If you wish to sample the delights of a range of genuine Irish pubs there is a reliable taxi service to and from the town of Ardee, Coutny Louth which is located only ten minutes drive away. La Cucina – The Italian Kitchen has been providing classical Italian Cuisine to the heart of County Louth for the past five years. Its owners Lucio, Rossano and Tita Orlandi offer a range of delicious dishes based on authentic Italian recipes. They are committed to using only the best ingredients and fresh local produce. The restaurant, set in the courtyard of medieval Smarmore Castle has been designed to create a friendly atmosphere in which you can relax and enjoy your meal. La Cucina has well chosen wines and aperitifs, superb Italian coffees-Bellissimo! Our indoor heated swimming pool incorporates a number of advanced features designed to provide you with ideal swimming conditions. It is 22 metres long and 7 metres wide. The pool deck has been covered with a new rubberised material that is both warm to walk on and slip resistant. The surrounding pool temperature is 29/30 Deg C while the pool water temperature is 28/29 Deg C. The shallow end of the pool measures 1.2m (3ft 11”) in depth and the deep end is 1.45m (4ft 9”). 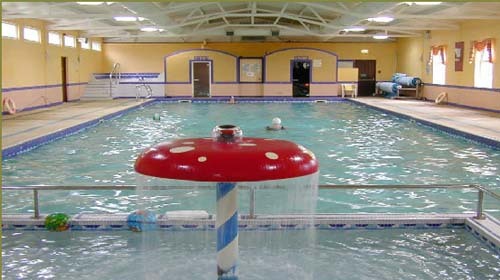 We also have a separate Toddler’s pool which is 3 meters in length with a depth of0.45m (18”). Although there is no limit on the amount of time you spend in the pool we recommend that you follow the National Safety Council’s guidelines, which state that children should spend no more than 40 minutes in the water while one hour is maximum for adults. The Relaxation Area is for adult use only. It consists of a jacuzzi spa, sauna and steam room. Here you can unwind and ease away the stresses and strains of life. The combination of hot water and the hydrotherapy massage of air and water jets in the jacuzzi spa can help to increase blood circulation, remove impurities and relieve tired muscles without putting any additional strain on the body. The steam room and sauna are not only places where you can unwind and take it easy but have the added advantage of leaving your skin soft and completely revitalised after a visit. All stress and strain usually subside greatly within a few minutes of entering the relaxation area, leaving you in a balanced state of mind and body. If you wish to exercise regularly our gym is fitted with a range of equipment that will meet the needs of everyone from the beginner to the keep fit enthusiast. On joining the club, one of our professionally trained gym instructors will take you through a personal fitness check and work with you to develop a programme that meets your own individual goals. Our gym contains a variety of modern cardiovascular equipment including treadmills, upright bikes, steppers, cross trainers, a rower and a recumbent bike. There is also a range of resistant equipment as well as free weights and an area for floor exercises. On receiving your programme our instructor will guide you through it, showing you how to use the equipment and perform the relevant floor exercises Our instructors are available to help you monitor the progress of your programme and answer any questions you may have. The Smarmore Sports Injury Clinic is run by Brian Keenan BSc BASRaT in the courtyard behind the castle. If you are interested in having a relaxing aromatherapy massage or want information on the various sport’s injury treatments that Brian has to offer you can get more information at 353 (0)41 6857255. Brian offers aromatherapy, hydrotherapy, sports massage and injury prevention treatments. Booking in advance is essential. Ravensdale Lodge Equestrian Centre north of Dundalk is an ideal place to go trekking or organise a riding lesson. The centre is located in the foothills of the Cooley Mountains and offers great scenery for trekking. 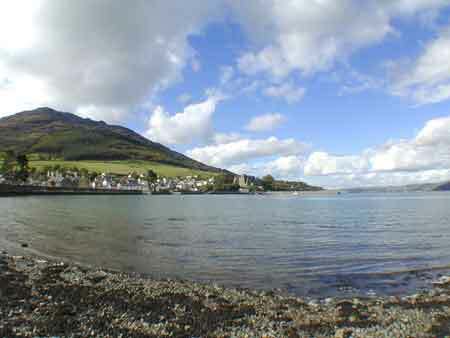 All level of rider is catered for and the centre can organise special all day treks across the Cooley Mountains into Carlingford. Booking in advance is essential. Ardee Shooting Grounds located just outside the town offer clay pigeon shooting for beginners and professional shooters alike. The centre provides the guns and all the equipment needed for the sport and its trained staff ensure that everything takes place in a safe and enjoyable environment. The Castle is in the midst of a number of attractive golf courses. Each course has its own distinct features. Whether it is parkland or links, 9 hole or 18 hole, modern or traditional there is something to cater for every level of golfing experience and preference. Booking is essential particularly if you wish to play at the weekends. Please note that some clubs have restrictions on the times that ladies can play. The individual club can advise you on this and their current fees at time of booking. A large chunk of the 365km Táin Cycling trail passes through Louth and Meath. It follows the route that Queen Meave’s army took on its trek across Ireland from Roscommon to Cooley in search of the famous brown bull. One leg of the trail goes from Navan to Omeath while another winds its way back from there to Mullingar via Tallanstown, Ardee (the scene of the epic duel between Cúchulainn and Ferdia), Newtown and Kells. There are numerous marked walks of different distance and difficulty to be found in our immediate area. They include canal and river walks, forest trails, coastal walks, heritage trails in a number of towns and even Slí na Sláinte healthy heart walks. The Táin trail in the Colley Mountains is one of the best known walking routes in the country. It offers 40km of marked trails to walkers of all types. There is a pleasant walk along the river Dee in Ardee which passes the point where Cúchulainn and Ferdia had their epic duel in the Táin. There are a number of walks along the Boyne. One starts in Drogheda heading for Slane along the Boyne towpath running parallel with the old canal. Another starts in Navan and also follows the river towards Slane. The beaches along the coastline of Louth and Meath also make interesting places to walk. The nearest forest trails to Smarmore Castle are at Rathescar Lake (en route to Dunleer) and the Townley Hall Woods between Drogheda and Slane. There are also forest parks at Dun an Rí near Kingscourt and Ravensdale north of Dundalk. The area surrounding Smarmore castle has a number of activities that are of interest to anglers. Coarse and game angling is available on some of the rivers and lakes in the area while sea angling can also be arranged. For details on angling options and permits contact the Eastern Region Fisheries Board. Dundalk Ice dome is the largest ice rink in Ireland. Public skating sessions are available every day. Some of the most famous racecourses in Ireland are located within one hours drive of Smarmore castle. The include Fairyhouse in Ratoath the home of the Irish Grand National, Laytown with its unique beach racing, Navan with its variety of themed and family orientated meetings, Bellewstown one of the smallest but most picturesque courses in the country and Dundalk Stadium the home of Ireland’s only all weather track. Details on dates of meetings. On rainy days Dundalk sports dome offers an option for families with its ten pin bowling lanes, snooker and pool tables, kiddies play area and restaurant. Ardee Baroque is an annual celebration of Baroque music that takes places in some of Ardee and Collon’s most celebrated buildings. The festival takes place over a weekend in mid-November. Since staring in 2004 it has featured performances of this distinctive music of the 17th and 18th centuries by the Irish Baroque Orchestra and other leading performers. The festival has also included “meet the instrument” workshops and films in the past. Venues used include Ardee Castle, St. Mary’s Church of Ireland, Ardee and Collon Church. The countryside surrounding Smarmore Castle includes some world famous visitor attractions, scenic country areas and a wealth of places connected with key events in Irish history and legend..
Monasterboice Tower and High Cross. Saint Brigid’s Shrine, Faughart, Co. Louth. Trim Castle, Trim, Co. Meath. Stephenstown Pond, Agnes Burns Cottage, Enterprise and Conference Centre. Kells Visitor Centre, Kells, Co. Meath.